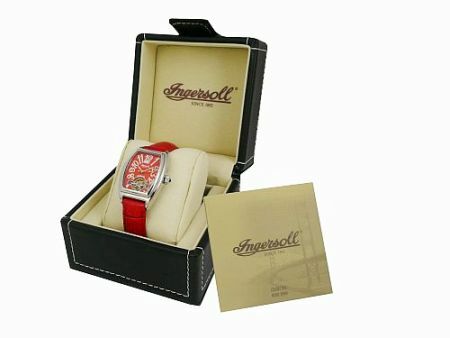 This Ingersoll watch is an eye catching red. A stainless steel case highlights a red face with white over sized swirling luminous numerals, along with white hands, a date indicator, and a secondhand. An exposed balance wheel adds enormously to the neo-vintage appearance. This automatic watch features a self winding movement with 23 jewels. A genuine red leather strap completes the package. This watch is water resistant to 30 meters and comes with a 2 year warranty. Perfect for anyone wanting old world appeal blended with today's time keeping technology.